Kid games for Android platform are not limited to entertainment anymore. There are games that make use of an educational elements. Such Android games incorporate areas like Math, language, visual response and memorization. In this article we are going to take a look at some of such educational Android games for kids. Here are some of the educational Android games and apps that you can play with kids. There are many other games that focus solely on subjects such as Math or Science. The games listed here are focused on improving visual response and memorization skills of Kids. The app has multiple games that test the ability of kids to recognize objects. The premise of the game is that it makes kids remember shapes and stuff. It forces kids to remember things and associate them. Different types of tests include games to recognize shapes, colors and numbers. Apart from the game to recognize objects there is also test to associate objects. Such tests can be good for kids to learn things quickly. The app has around 8 free tests and games. Additional 8 tests are premium and you have to pay in order to play them. By default the app is free to download. You only have to choose in-app purchases if you are interested in further games. The app is suitable for kids of age range 3-6 years old. This educational game is available on both Android and iOS. This app is a collection of logical puzzle games. Each level takes you progressively to harder puzzles. 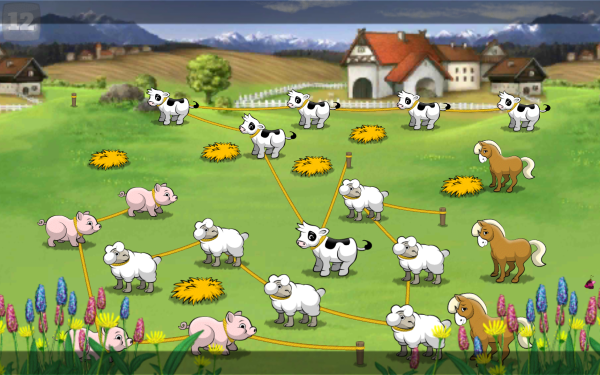 The game is simple, you have to attach each animal of same species in such way that they don't run away. The game supports multiple profiles and can keep scores for each player. It also has parental control so that parents can restrict how much time kids spend on this game. The game becomes very difficult in the higher challenge levels. The game is limited to only tablets and doesn't work on smartphones, you need to download phone version separately. 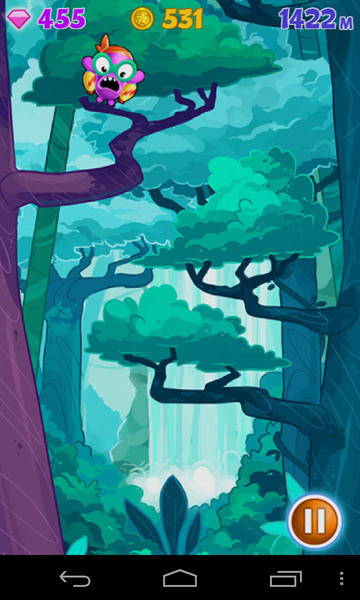 The reason being the puzzles require larger screen space and that's why there are two different versions. It also has few other issues such as you can't erase the step that you take in the game. You can only restart the game. This can make the game-play harder as you have to remember your every move. The free version of the app has around 15 challenges which are good enough for kids to solve for hours. Additional in app purchases give you access to Jurassic and underwater levels. If you have enjoyed the game there is also HD version of the game with premium upgrade. It has more number of challenges and few additional features. If you want phone version of the game then you have to download the game with name - Lasso Kid Pocket. The game is pretty simple to play but progressively gets harder with new level. 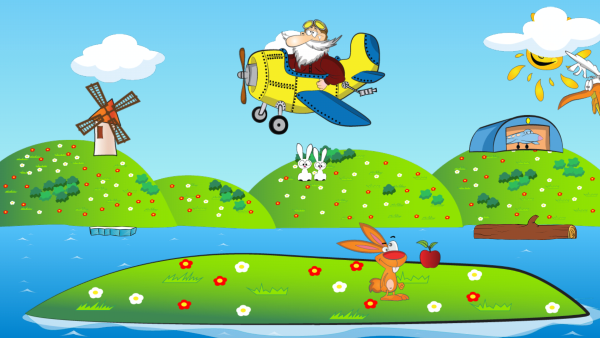 You have to help Zany the Rabbit to get the food that is dropped by the pilot. You have to tap in the area to make pilot drop the food. And there are few other things that can be done to make it easy for Zany to grab the food. You have to make sure other animals are not getting the food of Zany. However things are not that easy and you have few obstacles. You have to find out ways to get the food that is being dropped. The activity is guided and animation is funny for kids. It is not a full fledged puzzle game though. It is more of guided activity which is suitable for kids so that they can learn how the instructions needs to be followed. Some levels feel repetitive and if the kids understand the guided nature of it, then they may get bored with it. However if you want kids to understand instruction based activity then this is the game to try out. It has in app purchases where you get to upgrade the pilot's craft and add more food. The game is free on Android and iOS with in-app purchases option. Jinx is based on the gravity and tilt action. So this game is similar to other games such as hyper jump and doodle jump. Your job is to get the jinx back to space ship. In the process you may also have to get some gems and fuel objects. This helps you earn points and also get enough fuel for your jetpack. All you have to do is go up and not to fall down. The game is pretty easy in earlier levels for kids and parents. Though you may find the game easy to play it is relatively harder to master the higher levels. The premium version levels are also harder. The tilt action on tablet or smartphone become too tough to handle. Graphics of the game is really good and you don't even find pixel issue despite game not being an HD version of itself. In order to play additional levels you may have to subscribe to the in-app purchase for more levels. Though they are not expensive but due to lack of originality, you may not find the game reasonable to pay for. The game is available on both Android and iOS platforms. Google App Store has plenty of educational games for kids in various learning genre. Depending on learning requirements for kids using gaming format, your choice for apps will be different. Take a look at some of the above listed educational apps if you want to improve their visual skills.